The big Mercedes that was actually quite difficult to get around tight corners. Corgi really should have added steering to this one. Instead they had a device that made the windscreen wipers work. That did require someone turning the car over and moving a large white switch and the wipers do appear to be semi circles inside the screen but never mind! 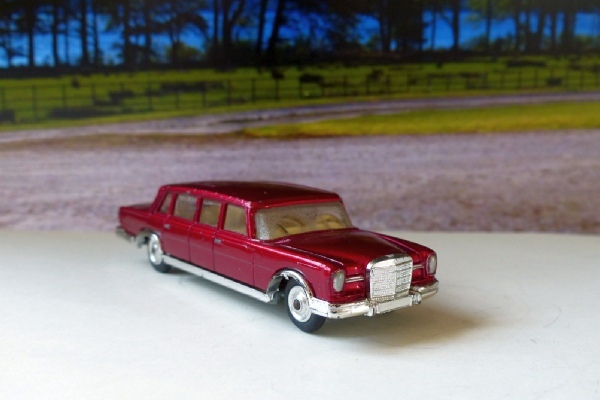 The crimson-red metallic paint is attractive and the chrome in pretty good shape. The radiator emblem is missing but the screens are nice. This is the lighter shade of the two used for this car. The two rear windows open and the wiper mechanism is working too. The red paintwork is actually in very nice condition with no obvious wear at all. Good suspension and a nice, clean base.